Morocco is consistently Africa's top tourist destination for good reason. With vast deserts, epic mountain peaks, bustling ancient cities, and craggy coastal towns, the country's landscape is a paradise of exploration that will inspire your nomadic spirit. While this North African nation makes a magical honeymoon choice for couples with a sense of adventure, experiencing the best of its diverse land is a far cry from plunging your feet in the sand and debating room service desserts (even though both of those delights will appear on Morocco's menu). If thrusting into foreign lands, embracing rich cultures, and assaulting your senses invigorates your very being (as it does ours), we've crafted an ideal 7-day honeymoon itinerary to rock the kasbah like you never knew you could. 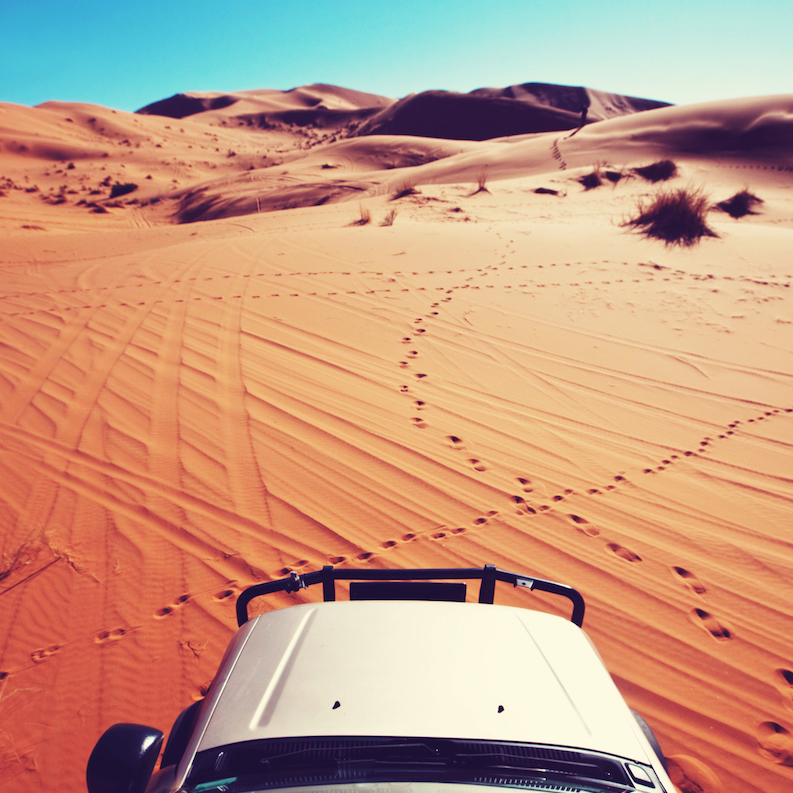 Traveling across Morocco is possible with reliable public bus and train systems, but your best bet to avoid overnight trips while allowing for maximum freedom is to rent your own car. Larger cities will have more affordable rates than suburbs, so grab a set of wheels when you touch down in Morocco, photograph the heck out of it (as your own proof of damage insurance), and be sure that you can return it to a different city - we'll be heading one-way on an ultimate Moroccan road trip. Throughout your journey, be mindful that Morocco is a mostly conservative country, and it will only enhance your experience if you adhere to the local customs by dressing modestly and covering legs and shoulders (especially in sites like mosques); a light wrap will become your best friend. Additionally, you'll likely encounter many instances of superb Moroccan hospitality, and will soon understand that sharing mint tea - as much the national drink as it is a favorite pastime - signifies respect and friendship. If ever offered, definitely consider politely accepting. Marrakech is Morocco's premier tourist city, where ancient customs and traditions embrace modernity unlike anywhere else in the country. While the sight of chain restaurants and familiar retail stores in the stylish Gueliz district might surprise you, hearing the sonorous Adhan call to prayer echo across the streets while smelling pungent spices through the old city's maze-like medina - one of the world's most colorful, diverse, and massive open-air markets - will wisp you right back into a comfortable culture shock. 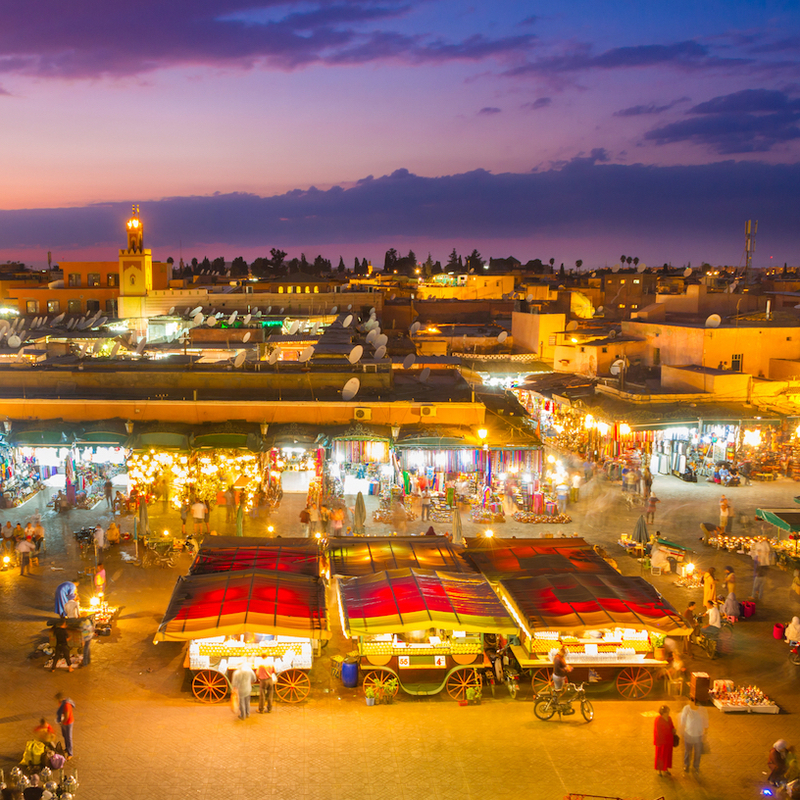 Sync with Marrakech's chaotic rhythm by strolling the colorful souks (markets) in the medina, where hundreds of vendors sell everything from north African spices to highly sought-after Moroccan carpets. This is the perfect opportunity to pick up a pair of traditional babouches (leather slippers) for the remainder of your trip. walking tours. The included breakfast is stellar, and the open-air courtyard is the perfect place to unwind after taking in the sights and sounds of the notorious Red City. Marrakech is often referred to as the drum which beats an African identity into the complex soul of Morocco. After a hearty breakfast, get out and expect a full day of exploring this great city. Consider a guided walking tour, or go at it on your own if you prefer to discover the city's mysteries at your own pace. Don't miss Jemaa el-Fna square, the thriving pulse of Marrakech for nearly a millennium, where snake-charmers and belly-dancers work beside food vendors along chaotic streets. Venture to historical sights like the Bahia Palace and Dar Si Said to witness dazzling displays of prided Moroccan architecture. 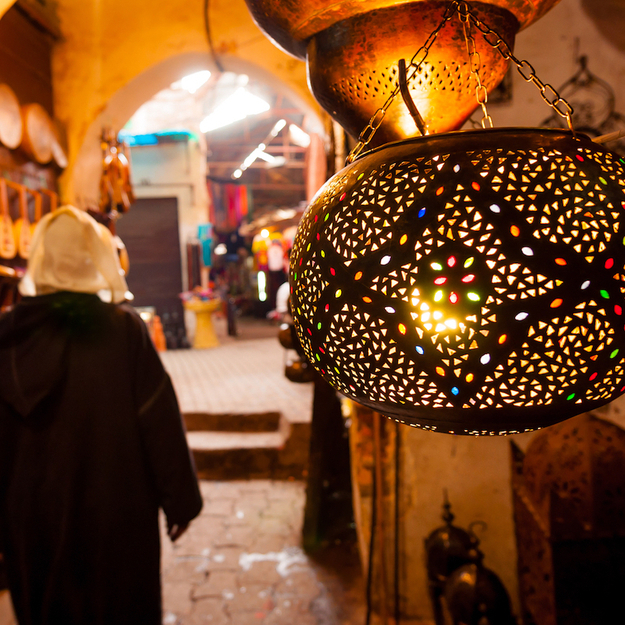 Practice your negotiation skills at the souks to score an authentic souvenir. Sample delicious street food like b'stilla (a pie of paper-thin pastry stuffed with pigeon meat, almonds, and spices), and be sure to pause and observe local life as it buzzes by, whether from a rooftop cafe or a side-alley teahouse. In the evening, head to the eclectic Gueliz district, where creative restaurants, bohemian lounges, and bourgeois nightclubs offer something for everyone. 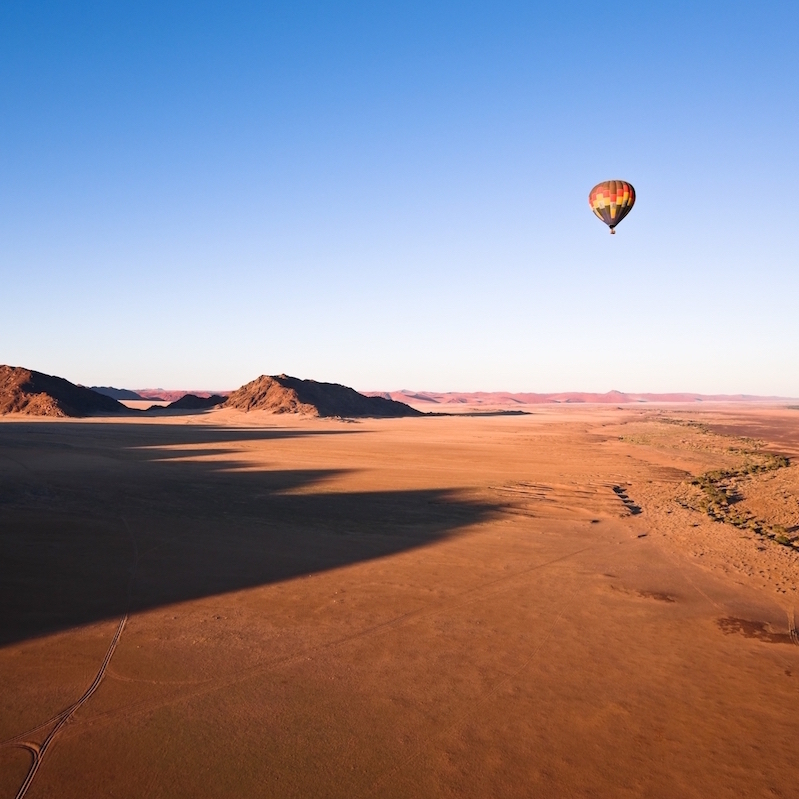 Take to the skies today to watch the sunrise from a hot air balloon. From your hotel, you'll be zipped to a remote plot of land outside of the city where hot coffee, delicious buttered croissants, and other local treats are served before gently floating high into the sky. Soaring above the crowds of Marrakech, and with the Atlas Mountains towering in the clear distance, this is a magical moment that will give a taste for the trip's upcoming shift in gear. Upon returning to your hotel, enjoy a goodbye lunch in Marrakech before continuing on with the 4-hour drive to Ouarzazate - a gateway to the Sahara desert, so scenic that it is second to only Hollywood as a filming location. Soak in the view as you cross the Tizi n' Tichka mountain pass while swerving through the High Atlas mountains as you approach the stopover city for a night. Stay: Le Temple des Arts combines Moroccan opulence and hospitality with Ouarzazate's link to cinema. This 7-room boutique hotel is utterly unique, ideally located in the city center, boasts an in-house spa and restaurant, and provides just the right level of respite after a long day of driving. 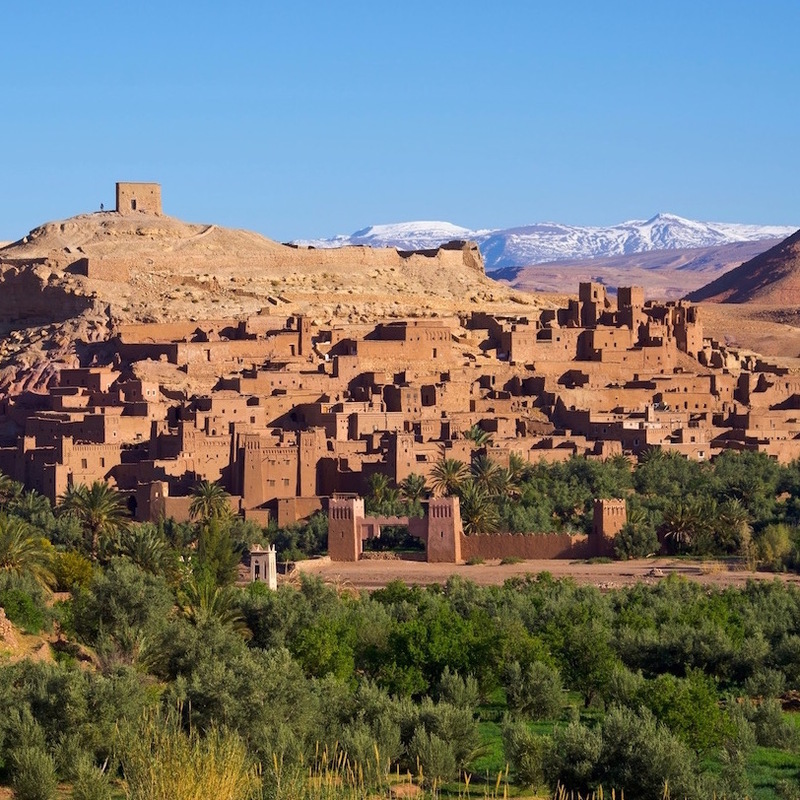 Explore the Valley of the Kasbahs near Ouarzazate before continuing on with your travels. This region was once an incredibly wealthy part of Morocco, with numerous kasbahs (ornate palaces) lining the otherwise martian landscape, the most famous of which is Ait Ben Haddou, known for its prominent display in Game of Thrones. Continuing east towards Algeria, you'll reach Merzouga, known as a quintessential desert town, with prime positioning to access Erg Chebbi, a sweeping oasis of seemingly endless sand dunes. 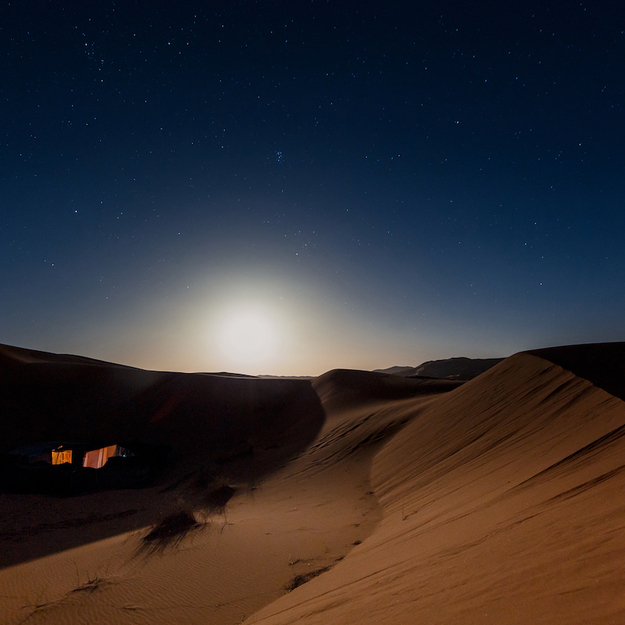 Aim to venture into the depths of Erg Chebbi just before sundown, and let the incoming starry night's sky wow you from this nearly impossible setting. Stay: Erg Chebbi Luxury Desert Camp is the stuff of dreams - a bucket-list desert experience and completely unique accommodation through and through. Set far from any other camps or signs of civilization, this desert glampsite offers complete tranquility amidst the sea of apricot-toned sands while still retaining the amenities required for a pleasurable honeymoon stay. Included meals are fresh and plentiful, with traditional Moroccan dishes like different types of tagine, slow-roasted lamb or seven-vegetable couscous as dinner highlights. The friendly local staff will make your desert fantasies come to life, and the communal nightly campfires fueled by songs and rhythms of the desert are a complete joy. Today is something of a payoff day. After navigating busy city streets and driving lengthy stretches across mountains and desert, you now have the luxury of waking up in one of the most serene and impressive deserts in the world. Take full advantage and turn Erg Chebbi into a playground: go sandboarding down the dunes and camel trekking across long expanses; drink tea with the local Berber people; spot pink flamingos in rare salt lakes; prepare a special picnic on the dunes, snap otherworldly photographs, and bury yourself up to your neck for a natural sandhammam to soothe your body after a day's worth of adventure. Back at camp, a selection of games, food and drink, and lounge options await to help you luxuriate like a sheik. A solid seven-hour drive from the deserts of Merzouga separates you from Morocco's unofficial cultural and spiritual capital city, Fez. Fortunately, the route offers a real feel of authentic Morocco, with plenty to see and do should you want to break up the trip. 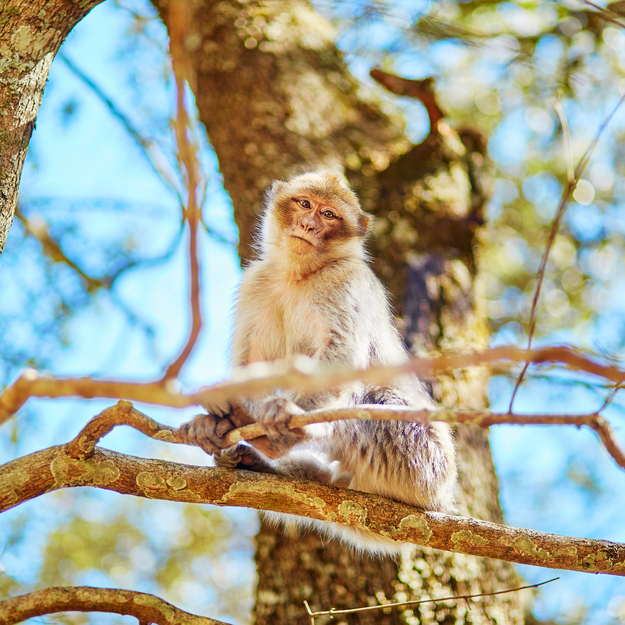 Nearly smack between your trip will be Midelt, a small city completely surrounded by mountains in the heart of Morocco's apple country. Grab a hot soup (like Bissara or Harira, served with tomatoes, lentils, chickpeas, and lamb) served with fresh bread for lunch, and browse the Atelier Kasbah Myriem afterward to scout for carpets and beyond - this extensive display of Moroccan craftsmanship is all handmade in-house by the local nuns which run the shop. Continuing on, make a stop in tranquil Azrou to visit the cedar forests which swarms with Barbary Apes (which are actually monkeys) that are known to be as friendly as they are cute. Just another hour will bring you into Fez; return your car, check in to your accommodation and get acquainted with the city known as "the Mecca of the West." Stay: Palais Amani is a 17th-century palace that has been recently renovated into a 14-room luxury riad with a citrus-scented courtyard and enormous suites. The entire complex is impeccably designed with unparalleled attention to detail. Just minutes from the walled Fes el Bali - Fez's largest medina - the hotel's location is ideal, though its in-house services (authentic hammam spa, cooking classes, and a locally-influenced restaurant, to name a few) may tempt you to never leave. Honeymooners are treated to a rose-petal room entrance with champagne and North African treats aplenty upon arrival. 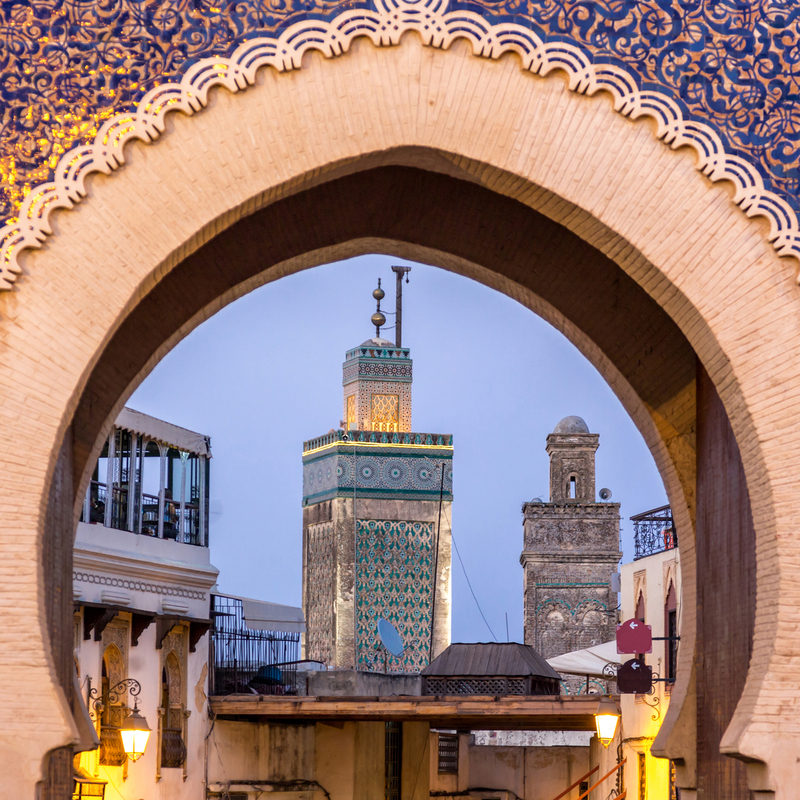 Similar to Marrakech, Fez boasts a large medina with endless sights, smells, and tastes to feast on. Fes el Bali is the largest pedestrian-only center in the entire world, and navigating its streets next to donkeys, mules, and hawking vendors is like taking a trip back to the middle ages. Throw yourself into the thick of things by visiting Chouara Tannery - Fez's most iconic shop, which operates today exactly as it did 1,000 years ago - or get above the action by climbing nearby Mount Zalagh, which offers a bird's eye view of the entire medina. Leathers, carpets, spices, and lamps in surrounding souks make last-minute souvenir shopping a breeze, but after over 1,000 kilometers of journeying through diverse lands, you might favor a bit of downtime before departing Morocco. Treat yourself to a lengthy royal hammam at Palais Amani's Spa, where you'll receive a full-body scrub down from face to toes in a heated room - the perfect way to rejuvenate both mind and body after a long journey through the deserts, mountains, and cities which define Morocco.